The card's write speeds of up to 85MB/s** allow you to capture RAW plus JPEG format, take fast-action shots, and shoot Full HD video2. Read speeds of up to 120MB/s** save you time when transferring large image or video files from your camera to your computer. 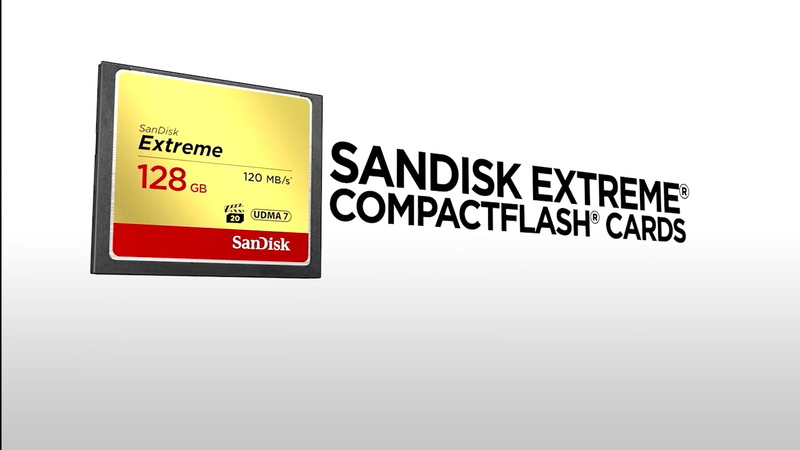 With Video Performance Guarantee-20 (VPG-20)1, the SanDisk Extreme CompactFlash Card lets you capture smooth Full HD video2 without interruption. VPG-20 guarantees a minimum sustained write speed of 20MB/s1 to keep up with the latest high-performance video cameras. You can be certain that your SanDisk Extreme® CompactFlash® Card will keep working, even under the most arduous conditions. Sealed with RTV silicone for added protection against shock and vibration, and backed by rigorous tests, they are designed to perform from -25°C to 85°C. **16GB: up to 120MB/s read speed; up to 60MB/s write speed. 32GB-128GB: up to 120MB/s read speed; up to 85MB/s write speed. Based on internal testing; performance may be lower depending upon host device. 1MB = 1,000,000 bytes. 1 Video Performance Guarantee enabled to ensure video recording at 20MB/s minimum sustained write speed. © 2018 Western Digital Corporation or its affiliates. All rights reserved. SanDisk, CompactFlash, RescuePRO, and SanDisk Extreme are registered trademarks or trademarks of Western Digital Corporation or its affiliates in the US and/or other countries. All other marks are the property of their respective owners.